Israeli and Palestinian students (age 17), from the Leo Baeck High School in Haifa, and from Ramallah, are attending this unique co-existence seminar, along with students from Austria and Hungary, for two weeks in a resort on the border of Austria and Hungary. The students will take part in challenging consolidation activities, creative drama, tours in the area and conversations about political issues. This is the second Seminar conducted by PCFF and the DIAKONIE institute from Austria. The DIAKONIE institute deals with humanitarian activities. PCFF representatives; Jalal Khudairy and Yael Roth-Barkai, are accompanying the group. Everything started with the arrival of the Palestinian group at 10 p.m.
getting to know each other. After the well-received presentation of the house and camp rules, the group played table soccer and table tennis together and the students got to know each other. All in all, there are two interesting weeks with a lot of exciting challenges ahead of us. Midnight. We finished our daily program a few minutes ago. In the morning we learned each others’ names. That's not easy when you have four nationalities and everybody pronounces their name differently. All day long we learned to know each other better, through special activities. "Where are you from?" "How many siblings do you have?" "What are your hobbies?" Slowly, slowly, one could see the students starting to work as a group and cooperate with each other. Most of the time the students kept to their own original groups, but very slowly the ice started to break. The group is heterogenic, four nationalities, different ages, some are 15, 16 and some over 17. Boys and girls, all of whom have different interests. During the break everybody played football (soccer) in the small grass field behind the hostel: 10-10 Ramallah vs. Haifa. Everybody got bitten by huge mosquitoes which had appeared after few weeks of rain. At night we went out to one of the local wineries to meet to the mayor and drink grape juice. We danced to yodel music which was played by an accordion player. On the way back, in the dark, Sagi walked with Allah, and it was already hard to see the difference between them. Maybe the grape juice and the local accordion with its simple sound opened the gate. Midnight, and the rain is pouring outside. We spent the day getting to know each other through swimming, spending time together and living together. We opened the morning with 3 hours of trying to come with a common goal for the camp. We aren't there yet. Tomorrow morning we will continue. We had a chance to speak separately with the Israeli group and to think about our goal for the seminar. Wonderful things came up; interests, a true willingness to hear the Palestinian side, curiosity and appreciation towards the Palestinian participants. We feel optimistic. The goal of the Israeli group: To have a true meaningful encounter, that deals with important matters. The goal of the Palestinian group: To make the people in other countries know us as people full of hope who deserve to live. In the afternoon we went to the magical lake to swim and enjoy drum and yoga workshops. The day ended with a bonfire. Yesterday ended with a slight feeling of something amiss; we hadn't succeeded in finding a group goal. Maybe that was what helped us focus today for few hours of strenuous work until we all agreed on a common goal: Four circles with four nations. After one vote, we had an agreed goal for the seminar. The participants signed on it. Afterwards a moving sentence was written on 29 pebbles, and each participant got a pebble with a letter to keep. 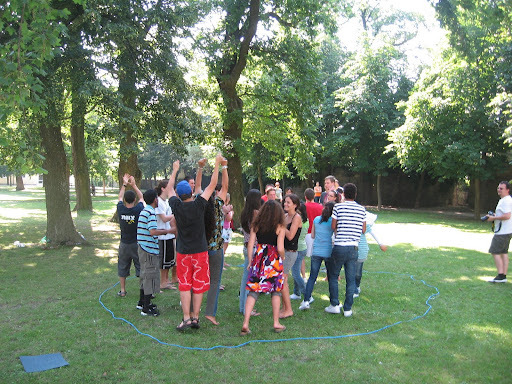 Before lunch we had a group challenge: ropes, tying – everybody worked together and accomplished the assignment. After lunch we had a treasure hunt in Rechnitz. In each group there were four participants, one from each nationality. For an hour a half the students solved difficult assignments in the village. All came back happy after having a challenging and interesting time and a chance to get to know each other better. Later on we went together to a memorial site named Kreuzstadl, where 200 Jews were murdered towards the end of World War Two, by a group of drunken local Nazis. We heard the story and had a ceremony in five languages. We stood in silence for a moment and read a chapter from Psalms and Kaddish (a Jewish mourner's prayer). In the evening we saw a fascinating presentation about Hungarian history. Hungary is a small country that has been through many difficult traumas during the 20th century. It went through separation from large parts of its land, a problematic cooperation with the Nazis, and had many long years under an oppressive Communist regime. It was a full and busy day which ended with feelings of fulfillment and progress. On Friday the map of Israel and the Palestinian territories was hung on the wall and throughout the whole day we had a workshop dealing with the basic terms of the Israeli- Palestinian conflict; the green line, 67 war, Intifada, etc. Sometimes everybody agreed on the meaning of the concept and sometime a discussion developed on the exact meaning, what is exactly Palestine and what is exactly the land of Israel? In the evening we lit candles and blessed on the wine we brought from Israel. Of course it raised questions and curiosity from everybody. The weather changed on Saturday and the rain fell most of the time, maybe as a symbolic act because of the Israeli-Palestinian conflict. We spent another half a day furthering our understanding of the conflict. In the afternoon we had optional activities; chess with Gabur (who beat 5 guys at once, with the only question left to be answered: who would hold on longer? ), beading with Razi, yoga with Yulia and football (soccer). During the seminar there will be four special evenings. Each group is preparing a characteristic evening of their nationality and culture. Yesterday we had the first evening that was prepared by the Austrian group. A local folk dance group preformed and quickly everybody joined the in the simple and charming Austrian dancing. We danced for almost two hours. The dance group members stayed for much longer then they were supposed to and told us they don't remember ever having such an enthusiastic group. Can Austrian dancing with Abdallah, Shira, Sagi and Ahssan bring about change? From the amazing energy it certainly seemed so. We took a tour of Shneeberg, in the Austrian Alps. After a long and intensive morning in which we dealt with the history of the conflict, we went on a fascinating and moving journey. Israeli and Palestinian students told their personal and painful stories. One saw his friend hurt by a soldier's bullet near the separation wall, another heard his brother speak about the explosion in Philadelphi Route, one couldn't go through the checkpoint on her way to a family visit in Jerusalem, one told about her enormous fear from the missiles which fell on Haifa, etc. In the staff meeting, Hawllah, the Palestinian teacher, said that her students are confused. Until now they used to be happy when Israeli soldiers got wounded or killed and now they are confused. All of the participants are going through a meaningful process which will probably change the way they think and maybe even part of their identity. In the evening the Palestinians had their presentation. Dinner included rice and lentils and a vegetable salad. Later the students performed an impressive folk dance. Towards the end everybody joined the dancing. During the last couple of days we worked intensively in a creative drama workshop. After warming up, we split into mixed groups. Every group had to prepare a situation that deals with a conflict. The students chose to prepare scenes about the most violent student in the class, soldiers at a checkpoint, a suicide bomber on a bus and a soldier that can't shoot his enemy. It wasn't easy for some of us to get into the part and play in front of everybody. At the end of the workshop we gathered and each group acted out their scene. We had a discussion after every scene and each participant could replace one of the actors during the play. The main goal was to try and understand the motives and feelings that each conflict raised. On Wednesday evening we had the Hungarian night with Goulash, Hungarian childhood games, we were exposed to the Hungarian language (an extremely difficult language) and of course Hungarian dancing. The camp's schedule changed as a result of a request from the Israeli group. Tomorrow we will have a fascinating discussion on political issues of the conflict, an activity that wasn't planned in the first place. In two days we will visit Vienna. One can say that this day was the reason we came here. For six hours in a slow, structured process, we went into a deep discussion and dived into the heart of the conflict. In the beginning every group chose a few questions to ask the other groups. We, the Israeli group, were asked “What do you think about the Palestinian right of return?” and “What do you think about East Jerusalem as the capital of a Palestinian state?” and “What do you think about the Palestinian right for an independent state?” Afterwards we had a deep, profound and uneasy discussion which was lead by three representatives, one from each group (the Europeans were together). Peter, Riyan and Sagi stood and explained their side. From time to time the other students asked permission to speak or ask the other group a question. Silence was in the room. Everybody was attentive despite the time and the length of the discussion .The discussion was lead in the most quiet and civilized way but with the freedom to say what you wish. “We won't allow Palestinian refugees to return”, said Sagi. “I won't give up the land that belonged to my family”, said Majdoulin. The discussion was moving and painful. There are large gaps between us and yet within them there is a willingness to find common issues, and solutions. When the discussion ended everybody hugged, and some cried. Later on we had the Israeli evening. Dinner was served in a Falafel stand and during the evening we performed different Israeli stereotypes; the high tech person, the man from the kibbutz, people from Tel-Aviv, Eilat, etc. We played childhood games, danced, sang Sholem Aleichem and Shlomo Gronich and finished with David Broza's song "Yihiye Tov", (It will be good). We really hope for a better future. This was probably the most important day for us. The last day of camp opened with a summation. Each participant sat on a chair and got feedback from the rest of the group. In the middle of the circle there stood a bowl with seeds, seeds of peace. We all got a seed at the end. A seed won't grow if one will not nurture and nourish it. So will it be with the seminar. If we won't take responsibility and continue with what we've learned and received, our efforts will have been in vain. We feel that we've been through a lot together and we would like to keep in touch and think of different activities to promote Dialogue and Peace. In the afternoon we had a set time limit to build a raft together as a group. After building the raft we had to sail together to the middle of the lake to win the box with the seeds. After putting in effort and working together, we succeeded. In the evening we celebrated with a barbecue dinner and a party.